The Jenckes Cup is named for the late Joseph S. Jenckes ('61), an alum and prominent Phoenix attorney. The competition is sponsored and judged by members of the Arizona Chapter of the American College of Trial Lawyers. Jenckes was a Fellow in the ACTL. Arizona State University beat University of Arizona in the 2018 Jenckes Closing Arguments Competition! This marked the 2nd year in a row that the Sun Devils came out on top. Arizona State University beat University of Arizona in the 2017 Jenckes Closing Arguments Competition! This marked the breaking of UofA's 7-year-winning-streak of the Jenckes Cup against ASU. It was a big week for in-state rivalries at the University of Arizona. University of Arizona Law beat Arizona State University. For the sixth straight year, University of Arizona Law students topped Arizona State University. A quick glance at this distinguished group reminds us that great trial lawyers remain resilient and committed to the development of future advocates like Heather and Sean. 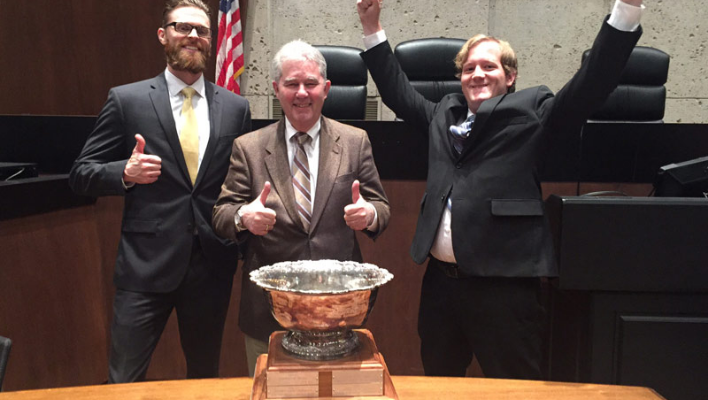 Last Friday, hosted by our good friends at ASU, Arizona Law students Robson Hauser (3L) and Sean Kelly (2L) prevailed at the 44th annual Joseph Jenckes Closing Arguments Competition.